One of the last to depart at this year’s Oxfram Trailwalker was a team wearing purple shirts that said ‘248 years old. 8 legs. 4 old men. 1 heart.’ What do these numbers mean? Neighbouring trailrunners glanced at the group of Hong Kong seniors as they loosened up with some jogs and stretches. Do not be fooled, however; all four are retired marathon runners representing Marathon Training Centre. Chan has run 22 marathons since his retirement in 2008; he was on the treadmill one day when he saw a live marathon shown on TV. The rest is history. Training was in full swing from May until late October, when most experienced trailwalker and team strategist Tsang Chin unfortunately lost his footing during a routine walk. Losing the 62-year-old talisman was a devastating blow for 248. With the team a member short, would they still be able to race? “[Tsang] was the guy who motivated us throughout the whole training programme. He was the one who set the routes, schedules, and the under 24 hour challenge,” said Chan. 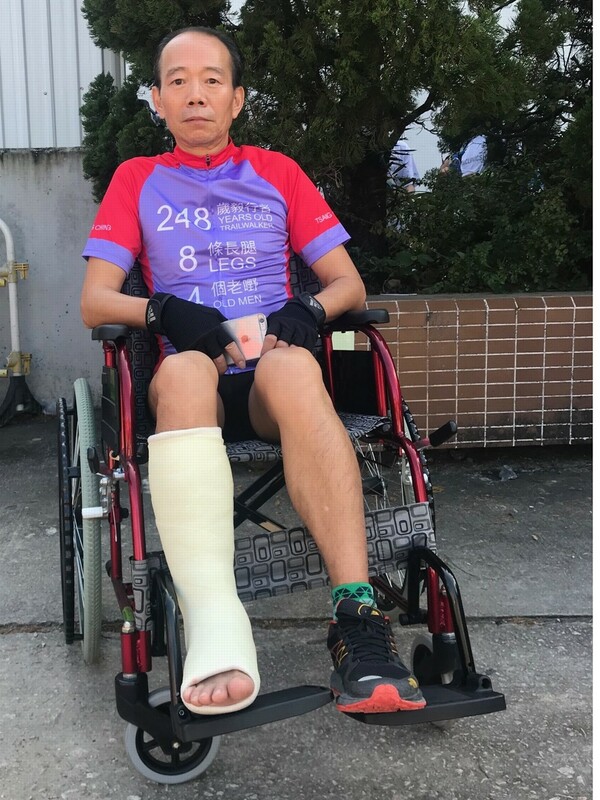 Tsang, who currently rests in a wheelchair, will be anticipating his peers’ arrival at the finish line as they adamantly march ahead as planned. “I will be there. No one is out. We are a team,” he said. The team will be tracked by a younger, fresher faced support team for any feed breaks and emergency supplies. Perhaps they could learn a nugget of wisdom or two from these old boys along the way. “Why do we keep doing this?” asked Chan Yan-yin. “Simple: to keep healthy. To make sure we have the right conditioning to meet our targets.